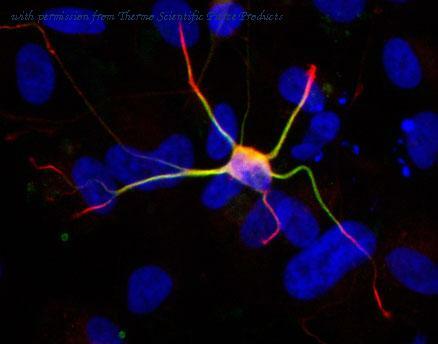 Immunofluorescent staining of neurons derived from human ESC with a 1:200 dilution of anti-doublecortin antibody (PA5-28536). 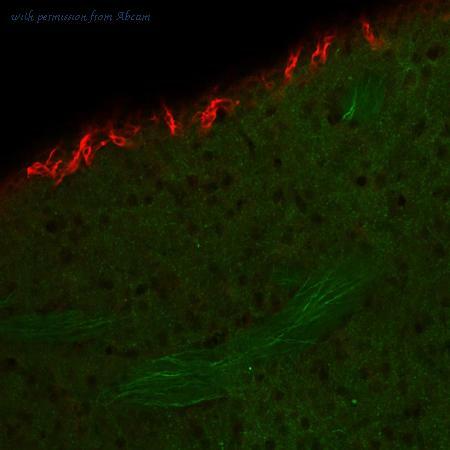 Anti-doublecortin antibody (red) colocalizes with anti-MAP2 antibody (green). 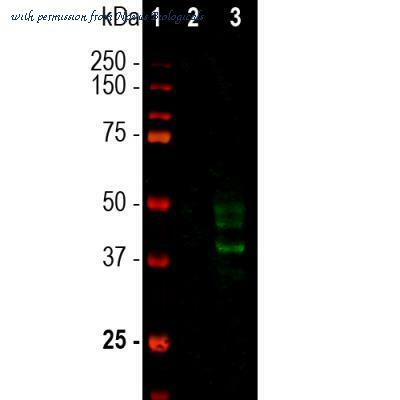 Western Blot analysis of Doublecortin using anti-Doublecortin Polyclonal Antibody (PA5-28536), in Raji Cell Lysate (30 ug of cell lysate) and at a dilution of 1:500. Western Blot: Doublecortin Antibody (3E1) [NBP1-92684] - Western blot of crude rat brain extract from a postnatal 3 day animal stained with NBP1-92684. Two bands at ~45kDa and ~35kDa show that NBP1-92684 binds to an epitope in the region of Doublecortin shared by Lis-A, and Lis-B, Lis-C and Lis-D, the C terminal 360 amino acids of Lis-A. Immunocytochemistry/Immunofluorescence: Doublecortin Antibody (3E1) [NBP1-92684] - Rat brain neural cultures stained with NBP1-92684 (green), a chicken polyclonal antibody to GFAP (NB300-213, red) and DNA (blue). The NBP1-92684 antibody reveals strong cytoplasmic staining in a population of small developing neurons. 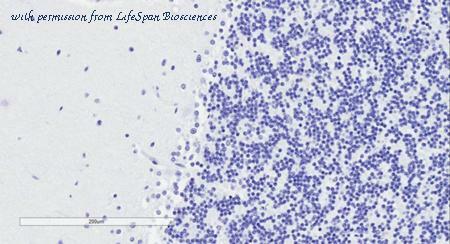 These cells are often found in small clumps as in these cultures, as in this example. Note that they are not positive for MAP2, which is characteristic of more mature neurons, and that the mature neuron shown is negative for NBP1-92684. 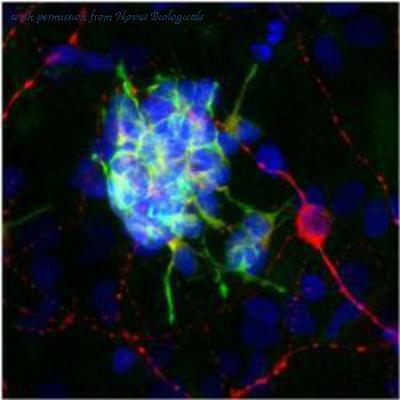 This Doublecortin antibody is therefore an excellent marker of developing neuronal cells. Western Blot: Doublecortin Antibody (2G5) [NBP2-37476] - Western blot analysis using DCX mouse mAb against Mouse heart (1) lysate. Western Blot: Doublecortin Antibody [NBP1-72042] - (0.01ug/ml) staining of Mouse fetal Brain lysate (35ug protein in RIPA buffer). Primary incubation was 1 hour. Detected by chemiluminescence. 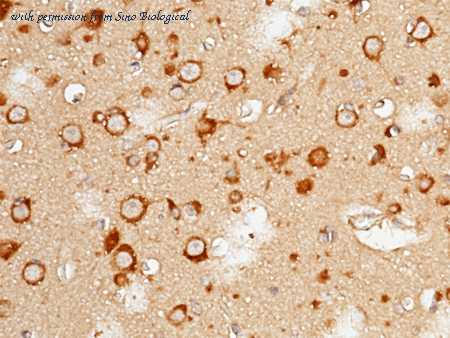 DCX / Doublecortin antibody (0.01µg/ml) staining of Mouse fetal Brain lysate (35µg protein in RIPA buffer). Primary incubation was 1 hour. Detected by chemiluminescence. 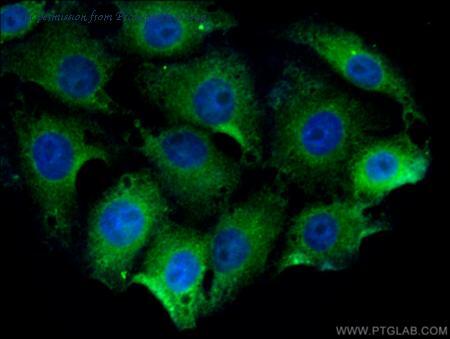 DCX / Doublecortin antibody immunofluorescence analysis of paraformaldehyde fixed HepG2 cells, permeabilized with 0.15% Triton. Primary incubation 1hr (5ug/ml) followed by Alexa Fluor 488 secondary antibody (1ug/ml), showing cytoplasmic staining. The nuclear stain is DAPI (blue). Negative control: Unimmunized goat IgG (10ug/ml) followed by Alexa Fluor 488 secondary antibody (2ug/ml). DCX / Doublecortin antibody Negative Control showing staining of paraffin embedded Human Cerebellum, with no primary antibody. HEK293T cells were transfected with the pCMV6-ENTRY control (Left lane) or pCMV6-ENTRY DCX (Right lane) cDNA for 48 hrs and lysed. Equivalent amounts of cell lysates (5 ug per lane) were separated by SDS-PAGE and immunoblotted with anti-DCX. 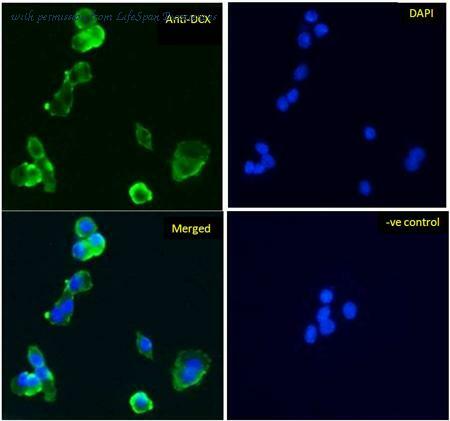 Anti-DCX mouse monoclonal antibody immunofluorescent staining of COS7 cells transiently transfected by pCMV6-ENTRY DCX. Flow cytometry of Jurkat cells, using anti-DCX antibody (Red), compared to a nonspecific negative control antibody (Blue). 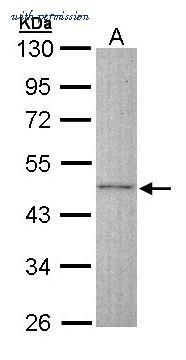 The DCX antibody from Proteintech is a rabbit polyclonal antibody to a recombinant protein of human DCX. This antibody recognizes human,mouse antigen. 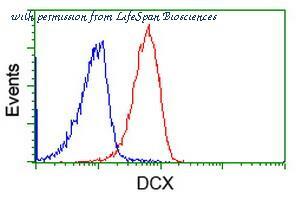 The DCX antibody has been validated for the following applications: ELISA, IHC, WB analysis. 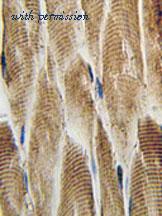 Immunohistochemical analysis of Paraformaldehyde-fixed, paraffin embedded (rat brain) with Doublecortin antibody. 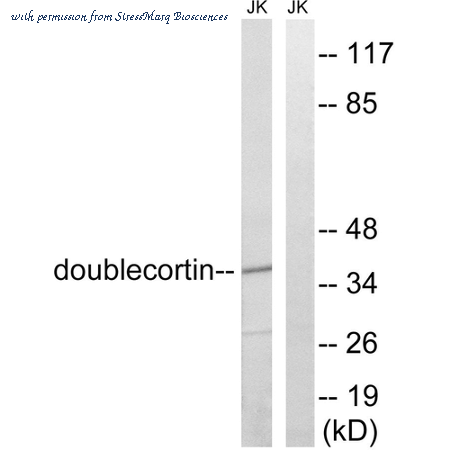 Western blot analysis of Human Jurkat cell lysates showing detection of ~40-45kDa Doublecortin protein using Rabbit Anti-Doublecortin Polyclonal Antibody (SPC-1294). Lane 1: Human Jurkat. Lane 2: Human Jurkat treated with the immunizing peptide. Primary Antibody: Rabbit Anti-Doublecortin Polyclonal Antibody (SPC-1294) at 1:1000. Predicted/Observed Size: ~40-45kDa. Immunochemical staining of human DCX in human brain with rabbit polyclonal antibody (1 µg/mL, formalin-fixed paraffin embedded sections).